The battle for the elephant’s survival in Burma is vital for the future of the species. The availability of the largest reserves of elephant habitat in Asia married with the greatest concentration of elephant experts on the continent represent real hope that elephants will continue to thrive here. 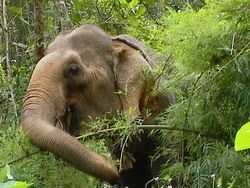 EleAid trustee Charles Begley produced A Report on the Elephant Situation in Burma in 2006 which comprehensively summarises the current status of Burma’s elephants. Burma still uses trained elephants in its large-scale logging industry. Although the government officially banned wild capture in 1994, it is known to continue to fulfil the needs of the timber industry. Despite having the largest forest tracts of all, deforestation is taking place at an alarming rate. Although in theory Burma follows a policy of selective logging, evidence suggests that large areas are being cleared, much of which may be the result of illegal activity. The shrinking and fragmentation of elephant habitat is placing increased pressure on the remaining elephant population. Poaching for ivory, meat and other elephant products only takes place on a very small scale in Burma, however poaching to capture elephant calves is known to be common place. The mother and often other members of the herd will fight to protect the calf and the hunters frequently resort to killing them. The calves are then smuggled in to Thailand for work in the tourist industry. Over the past 200 years, Burma has used elephants on a large scale in the timber industry; an activity that is still a vital part of the Burmese economy today. 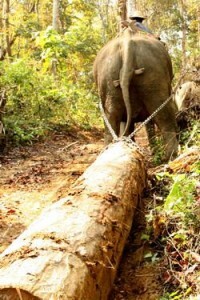 Logging is carried out by the Myanmar Timber Enterprise (MTE) and they employ or sub contract around 4,000 elephants. The use of elephants allows a policy of selective logging which, in theory at least, allows the MTE to extract valuable timber while leaving the forest otherwise in tact. This policy can only be fulfilled using elephant labour. The main work of the elephants is to drag felled timber from the cutting area to roads or rivers from where it can be transported out of the jungle. Logging work is exceptionally hard, but strict regulations are designed to maintain the health of the animals. Burma has more elephant experts than any other Asian country and leads the world in elephant management, veterinary care and mahout skills. Transportation and baggage elephants – particularly in mountainous forest areas where the only alternative to using elephants is to travel by foot. Not only do the MTE and villagers use elephants in this way, but it is also reported that the guerrilla Shan State Army and the Karen National Liberation Army use elephants to get around. Tourism – both elephant shows and jungle trekking, although this industry is far less developed and widespread as in neighbouring Thailand. 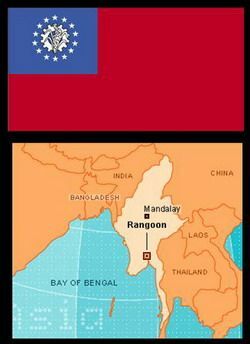 The government of Burma/Myanmar is an autocratic, military regime that has earned pariah status in the world. Sanctions from other countries and excessive government control and inefficient policies have had a catastrophic effect on the economy and infrastructure of Burma. Many governments and international NGO’s refuse to have anything to do with the regime and those that do are hindered by the lack of economic development. The availability of large areas of elephant habitat, the presence of a large number of local elephant experts and a culture that holds elephants in high esteem creates great possibilities for comprehensive and integrated elephant conservation policy. This is however unlikely to ever gain much credibility or headway while the current regime remains in power.